Tomorrow (Saturday) the Mission Neighborhood Center is hosting live poetry and storytelling about “the Mission and beyond”. They’re raising funds for their GED program, and all the money goes straight to their students’ testing fees. Help out the kids! $10 later they’re that much closer to glory! You were a kid once too, someone probably gave you ten bucks. 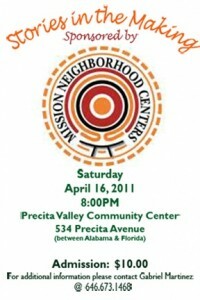 Precita Valley Community Center at 534 Precita Avenue, 8-11pm.